I have tried to enforce my 24 hour rule. When I'm angry or emotional I don't blog about the issue or email the parties involved (or at least I really try hard not to). I need 24 hours to let the temper move through my system and to contemplate whether or not I really need precisely 59 four letter words (many repeated) to get my point across. We had a lovely weekend with the in-laws visiting. It was a tough crowd to please this time. Not only did NBB's parents come, but they brought along three nephews--two of which are teenagers and can be a challenge to entertain without a gaming system. In the last few months we have had the Body Worlds exhibit at the Science Museum of Minnesota. I have been wanting to go very badly, but with the travel schedule it just hasn't been possible. It was closing on Sunday, December 3, so I thought it would be a fun way to cap off the in-laws visit--what boy at any age wouldn't want to look at dead plasticized bodies? I ordered tickets online for 12:15 on Sunday, looked at all the warnings about how the tickets were non-refundable, and felt excited about such a unique experience for the family. Rant, rant, rant, rant, rant, rant, rant, rant. Oh, I am so angry--at myself and at the museum. The rational part of me gets the non-refundable part. I've organized and led birding tours and there is a point where an event is non-refundable. The other part of me is angry with the museum because it was an easy mistake--they aren't usually open 24 hours so when you see 12:15 on a Sunday you might automatically think its for the noon time. I feel like I should be able to get part of the money back, but then again I should really pay more attention to the whole am and pm thing. I think I would be taking this a lot better had the box office attendant been even slightly sympathetic to my plight. A simple, "Gosh, I'm sorry we're sold out and here's an explanation of why we can't give the money back." as opposed to "Nope, we're sold out. You've lost your money. You should have been here last night." Grrrrrrrrrrr. It will be awhile before my temper settles on this one and I can visit the museum again without tossing spitballs at the box office. We did find other entertainment. Thank goodness for bald eagles. NBB was at a loss at to what to do with our five guests and I finally said, "Well, if you're leaving it to me, we're going bird watching." So we piled in the van and went to look for bald eagles. We found a dozen in less than ten minutes--they're almost too easy this time of year. We did end up doing the Holidazzle Parade. In the weeks between Thanksgiving and Christmas, Minneapolis has a parade that has all the floats, marching bands, choirs, and pretty much anyone walking the parade covered in lights. It's generally a good time, although this past weekend it was 10 degrees--a little nippy. The in-laws took it like real troopers. The upside with the super cold weather is that it was very easy to get a good spot to watch the whole parade. On nights when it's in the thirties, it's wall to wall people out there. 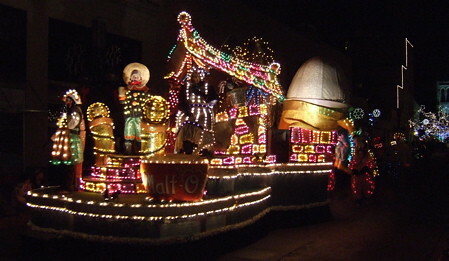 Here's the Mother Goose float. That's Humpty Dumpty on the back, I'm not sure who the people in front are supposed to be. Here is our nephew Sam desperately trying to keep his cool by trying to avoid his Aunt Sharon's camera. 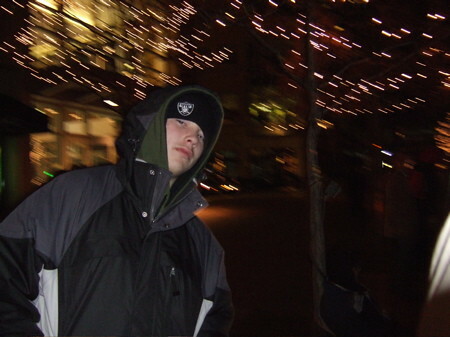 I think he kept his cool with the holiday lights dancing behind him, but what do I know compared to a 15 year old? 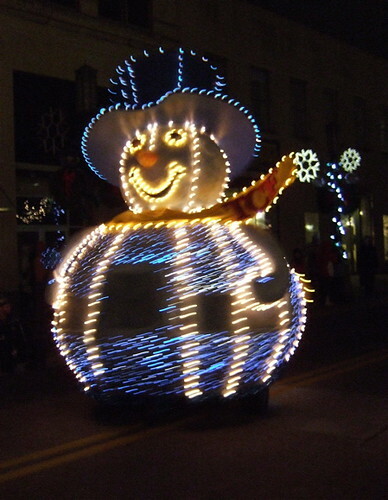 Here's a large snowman that spins its way down the street. 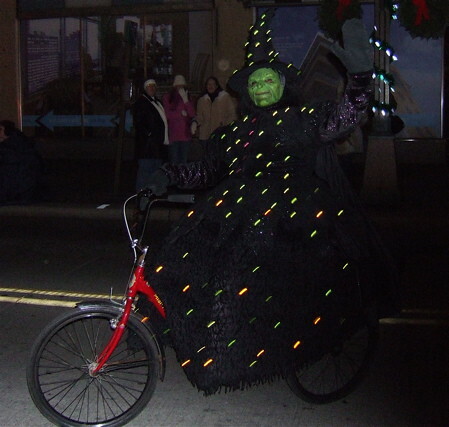 Heres the Wicked Witch of the West riding her bicycle around the Wizard of Oz float. Because when you think of the Holidays, you think of a scary looking witch. The Holidazzle is fun, all you Minnesota people who read the blog should make a trip into downtown to watch.